U.S. Targets Chinese Company For Supporting N. Korean Nuclear Program : Parallels The U.S. Department of the Treasury says a Chinese conglomerate on the North Korean border has helped blacklisted North Korean companies procure raw materials that could be used for nuclear weapons. Visitors look at the China-North Korea Friendship Bridge across the Yalu River from Dandong, in northeast China. A company operating from Dandong is under fresh sanctions by the U.S. The U.S. is targeting a Chinese company and the people who run it for allegedly helping North Korea with its nuclear weapons program. It closely follows the North's fifth nuclear test, which took place earlier this month. "Each new nuclear test...spurs this kind of scramble to do something," says John Delury, a professor of international relations at Seoul's Yonsei University. "And sanctions is the kind of preferred choice." 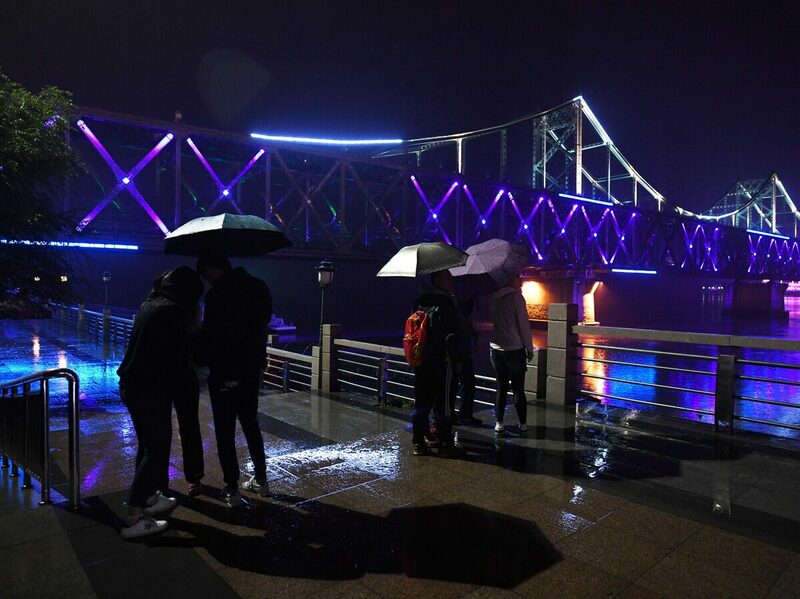 Targeted sanctions will hit a Chinese conglomerate based on the North Korean border — Dandong Hongxiang Development Company. The U.S. Department of the Treasury says the firm has helped sanctions-blacklisted North Korean companies procure raw materials that could be used for nuclear weapons. The same company — along with three officials and the woman who runs it, Ma Xiaohong — has also been indicted on U.S. charges it served as a front for North Korean businesses trying to bank and trade, prohibited under sanctions. Chinese police announced a week ago they have launched a criminal investigation against the same company for "grave economic crimes." "This has long been a struggle, is trying to get at the most sensitive firms and the most sensitive activities, which is nuclear proliferation," says Kent Boydston, a research analyst at the Peterson Institute for International Economics. "There were other activities they were involved in - trade - that wouldn't necessarily be illicit trade in of itself," says Boydston. "But because these organizations, these networks, these people are so interconnected with each other, it really begs the question of: if you allow one activity that seems licit, then are you really just aiding and abetting an illicit activity?" Stopping this particular conglomerate may plug one hole in current sanctions imposed on North Korea. But the question of whether it will effectively slow North Korea's nuclear advancement remains. Delury says this is probably too little too late. "That said, every further step [North Korea makes] worsens our security. Both Americans and South Koreans. So it doesn't mean you just throw up your hands and do nothing," Delury says. The debate continues about what to do next. One thing is clear: sanctions have not succeeded in halting North Korea's development of nuclear weapons.